Grill-out, barbeque, picnic, or party - whatever you call it, inviting family and friends over for an afternoon or evening in the back yard is a staple of warm-weather life in Cincinnati. In many cases, these types of gatherings are casual and laid-back affairs, but that doesn't mean they aren't worthy of entertainment spaces designed to accommodate them. We've combed through our gallery of past projects, and have come up with several ideas for converting your backyard into the party space of your dreams. Bring the inside out and the outside in. Parties can often stretch between the inside and outside of the house. To handle these types of gatherings in the project above, Neal's installed glass panel doors on the exterior wall of the living room that fold open to create a large opening to the back porch. 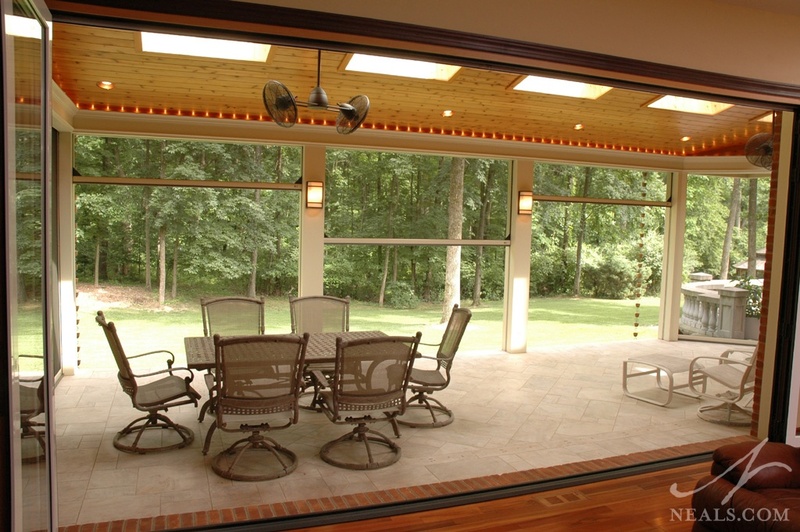 Motorized screens on the porch can be raised or lowered depending on the party's needs. Provide options around the yard. The view outside the back door in the remodel above provides a glimpse into the options this back yard provides. A cozy sitting area under a porch roof off the house gives way to a fire ring. To the right, the grill and a table for food. Just beyond the backyard party space, a pool and grassy area are perfect for more active guests. 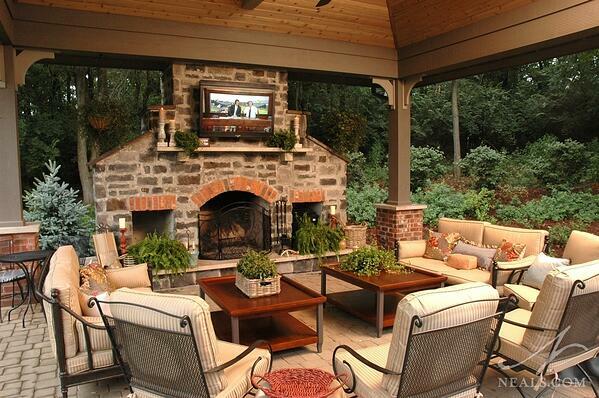 Create an outdoor room without losing the indoor amenities. 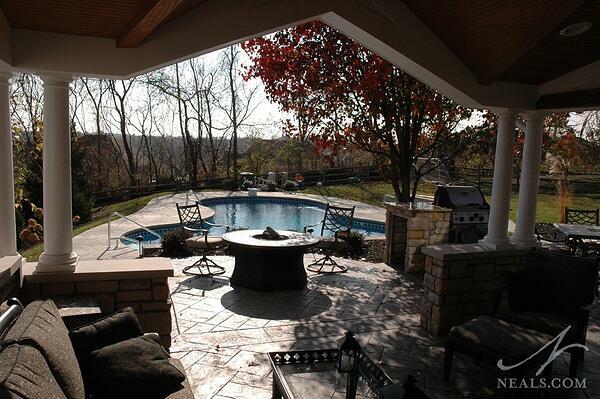 In the remodel above a large pavilion structure is positioned over a paver patio. A full compliment of furniture creates a comfortable den for a typical Friday night party crowd. Just like an interior room, the fireplace and TV (an outdoor model positioned to be protected from the elements) create a focal point for watching movies or the big game, or enjoying a quiet evening chat with friends. Cincinnati summers are pretty notorious for high temperatures, higher humidity, and mosquitoes the size of baseballs. 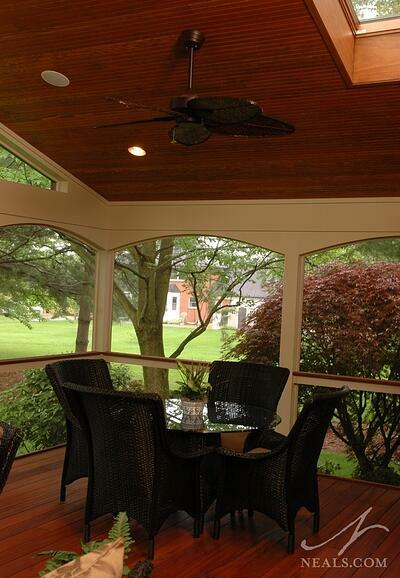 To create more useable entertaining space, Neal's built the screened in porch above with these challenges in mind. 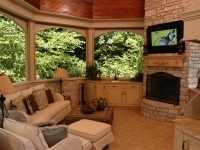 Large fans on the vaulted ceiling keep fresh air circulating, while screens surrounding the porch keep the bugs at bay. Comfortable outdoor furniture invites guests to sit and maybe play a hand or two of poker. Some families play host to a variety of gatherings, from a handful of close friends, to large crowds of aquantances. The above 2015 Local Contractor of the Year Exterior Specialty winner was designed for exactly that. 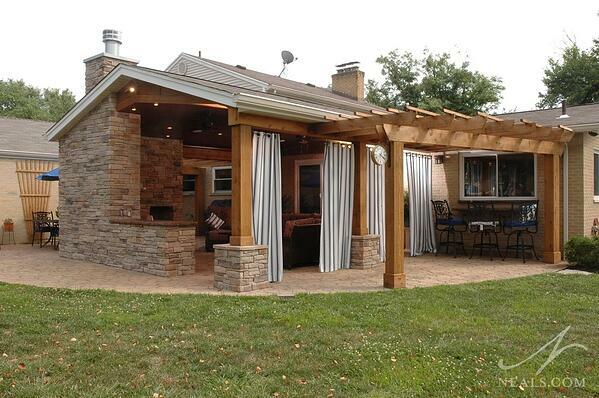 The patio and structure compliment the home and yard, and provide a spot to relax when the family is on their own. When guests arrive, however, the furniture can be rearranged and the space becomes a key component of the party's traffic flow into and out of the house. Take the basement party outside. 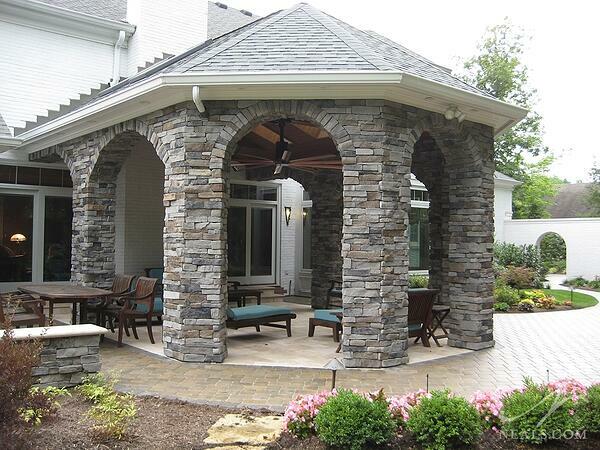 The structure in this backyard remodel above forms a centerpiece to a variety of zones. These zones have more in common with your typical lower level than an outdoor room. This space is made up of outdoor seating (with fireplace and TV), a dining area a few steps from the kitchen, a bar counter just off the window of the actual bar housed inside, and a patio for milling under a pergola. It's like a man cave, but with more fresh air. Need more outdoor patio ideas? Click on any of the thumbnails below to read more about our award-winning outdoor living projects.